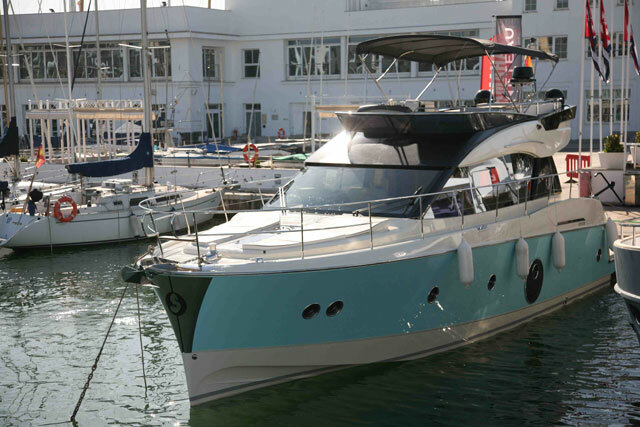 The Monte Carlo Yachts 70 is a superyacht for the drive-it-yourself (DIY) crowd, perfect for those who like to venture out on their own, without professional crew. At a shade over 21 metres, the Monte Carlo Yachts (MCY) 70 seems to be knocking on the door of superyacht territory - especially if you find yourself relaxing at the enormous bow lounge behind dark sunglasses and a floppy hat, looking like a celebrity in Monte Carlo. But with its sophisticated systems, powerful engines and easy drive-ablity, this zippy model is also more for those who like to venture out on their own, without professional crew. 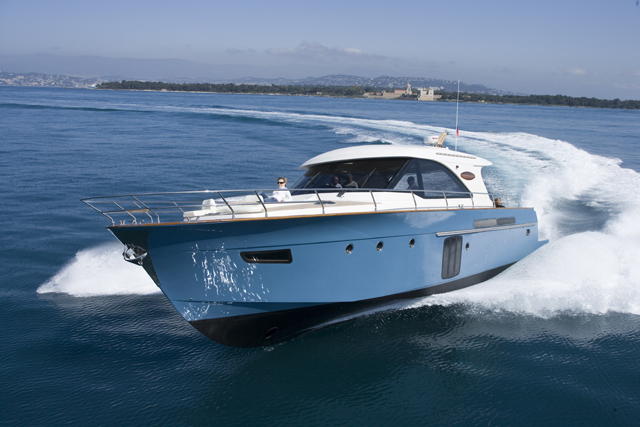 Built in Monfalcone, Italy, the MCY 70 lives up to the styling Italians are known for such as her unique exterior, comprised of rounded and swoopy lines. Her profile is aggressive while her rounded port lights add a retro appeal. 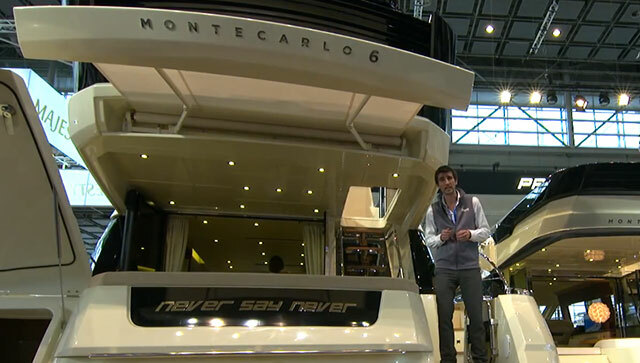 A combination of French ownership (Groupe Beneteau) and Italian design (Nuvolari Lenard), Monte Carlo Yachts builds contemporary hulls from 20 to 32 metres. 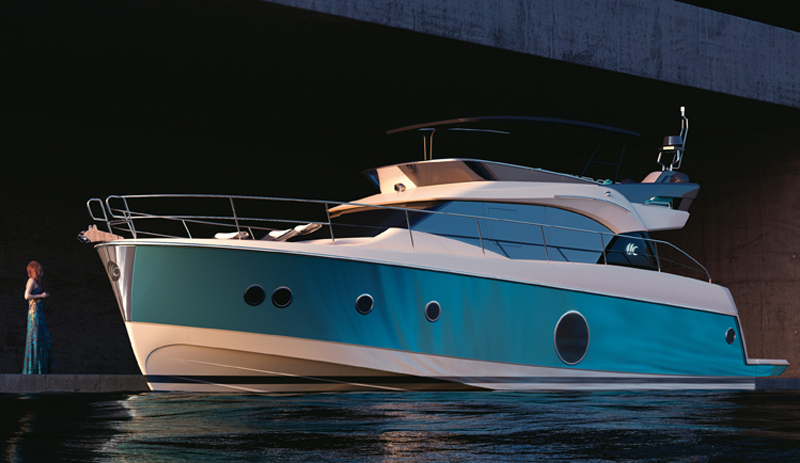 The second smallest in the line, the MCY 70 is more than just a pretty face with her ZF pod drives and joystick control that deliver a top speed over 30 knots. 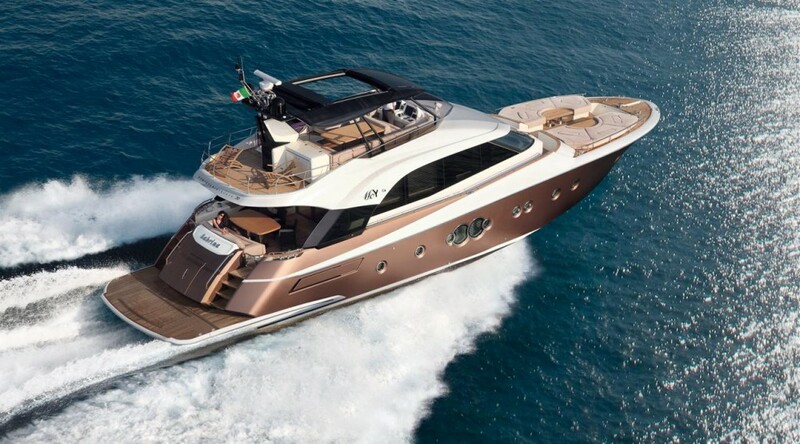 This Italian luxury yacht provides the best of both worlds: from relaxing on its large decks to venturing out on your own thanks to the MCY 70's drive-ability. Steps lead up either side of the transom to the cockpit, which is protected from the weather by the extended flybridge overhead. From here you can look down onto the large, hydraulic swim platform that lowers to just below the waterline. 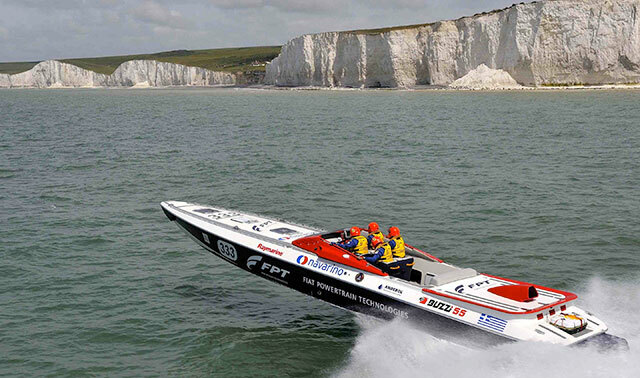 It can carry a maximum load of 590kg and makes launching the tender or a PWC easy. It’s also a great teak beach where you can relax on a chaise lounge while dipping a toe in the water. Fashionplates abut either side of the cockpit, funneling the wind and spray away from its ocupants. Substantial stainless steel railings lead along the side decks all the way to the Portuguese bridge at the windshield whose corners curve gently at the sides presenting a panoramic view, uniterrupted by a center mullion. On the bow, a central walkway bisects two crescent-shaped tables with sprawling sunpads on either side. A stowable fabric sun shade on carbon fiber poles may be erected over the entire lounge that is accented with pop-up headrests and soft lighting. This bow arrangement alone is worth the price of admission as the feeling sinks in that you’re truly in a special place - a privileged getaway of the glitterati. Everything aboard has a feeling of refinement yet heft. 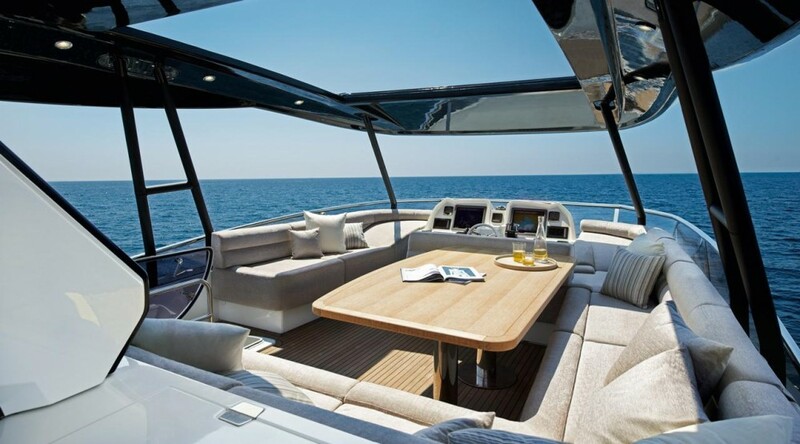 The cleats are massive and the tables, although an elegant combination of stainless and teak, look like they could lift the boat itself. Just ahead is a well where crew can stand safely and operate the massive windlass that is elevated to about thigh level. A teak-clad staircase to port leads up from the cockpit to a large flybridge that is covered by a hardtop with a retractable fabric sunroof. Amidships is a dinette that will seat six for dinner and behind that, next to the utility mast that holds antennas and KVH satellite domes, is a galley module with an electric grill, ice maker, fridge and sink (all standard equipment). A double helm seat is on the centreline behind a low reversed windshield. Cameras are needed for visibility aft when backing into a slip if you’re driving from up here. Two Raymarine G Series MFDs front a dash that also has a full complement of engine and systems controls. An angled lounge is to port with more companion seating outboard on the other side. The view forward from here is excellent not only all around, but also down to that fabulous bow lounge so the captain always knows how the party is going. The captain of this yacht will never miss out on the action, as the MCY 70 links together a spacious lounge with a flybridge helm. The MCY 70 lives up to the reputation for style that Italy is known for with interior accents on luxury wherever the eye lands. Leather-wrapped handholds, contemporary stainless accents, and upscale fixtures abound. Two dozen different materials are used on the interior finishes and include walnut and grey oak wood veneers, various leathers, Travertine stone and a selection of luxe fabrics from European designers. Inside, grey oak, beige and taupe blending to an upscale appeal. The galley is forward to starboard with Miele and Isotherm appliances subtly hidden behind wood and painted surfaces. Although this is expected to be the “standard” model, the MCY is a custom design so for those who like the popular aft galley layout, it’s available as well. The main helm is to starboard with a leather-topped dash and a matte lacquered finish to cut glare. Twin Boning monitors serve up all information from navigation to systems monitoring and the joystick and thruster controls are side-by-side to the left of the leather-wrapped wheel (a bow thruster is standard while the stern thrusters are optional). A triangular, opening side window helps the driver communicate with crew outside and there’s a pantograph door to port so the skipper can get outside and forward without having to walk all the way back through the saloon. Three or four cabins are available on the lower deck, all with ensuite heads. The full-beam master stateroom amidships includes a bed on the diagonal, a starboard L-shaped lounge, and a large head aft that separates the sleeping accommodation from the noise and vibration in the machinery space. A full walk-in closet may be located in the starboard forward corner or a fourth cabin with over/under bunks may be substituted here. 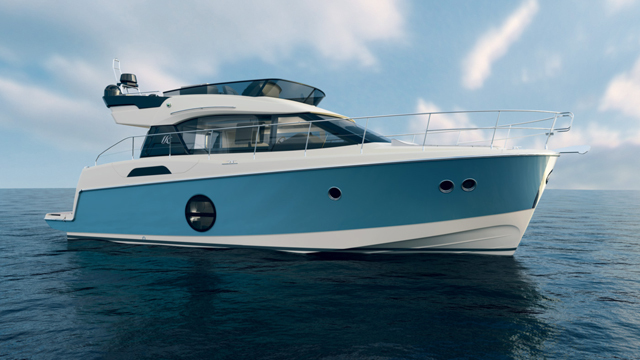 The two large round windows that give the MCY 70 her distinctive exterior are a welcome addition in the master. The large ones provide wonderful views out even when seated, and the two small ones open so fresh air circulates. Two crew cabins are aft and may be accessed via the engine room or through the lift-up stair case that leads to the flybridge. In the case of an owner/operator vessel, this can become a fifth cabin for guests or kids because the finish in the crew accommodations is on par with other owner-occupied spaces. Twin MAN V8 1200 HP engines are standard and are the only ones offered. However, you may choose between V-drives or ZF 4000 pods with joystick control. Our test boat had the latter and if you’ve never driven pods with 1200s, it’s a hold-onto-your-hat experience. Our top speed was 33 knots at 2300 RPM. A more economical cruising speed is 25 knots that will yield a 280-mile range. With Kevlar in the hull construction, cored interior doors and cabinetry, and a carbon fiber T-top on the flybridge, the MCY 70 is strong but also light so if you slow down to 10 knots at 1000 RPM, the range increases to 600 nautical miles. The engine room is compact but workable with twin gensets, an optional watermaker and hydraulics for everything from the swim platform to the Humphree ATOS trim tabs. Large banks of Mastervolt AGM batteries sit low in the hull and there are multiple chargers for redundancy. The pods are tucked way back in the hull and access is tight. 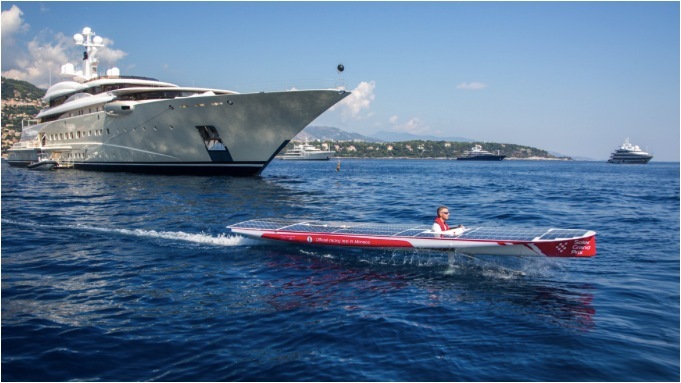 At speed, the MCY 70 did slow graceful turns in about three boat lengths. In idle and with just the joystick, the boat easily spun in her own length. Inside, the boat remained hushed even with one of the two 23kW Kohler gensets working the optional Seakeepers and the two engines running at 1800 RPM. The base price of the MCY 70 is around $3 million but fully loaded, add another 40 per cent or so to that. Clearly, if you find yourself in the market for an MCY 70, you’ll not likely be swabbing the decks or changing the engine oil yourself. But having no need for a professional captain to run this model is not only cost effective, it’s also liberating. You go where you want, when you want and you drive yourself, which is half the fun of getting there. So although it may not be exactly do-it-yourself, it’s definitely do-it-for-fun. 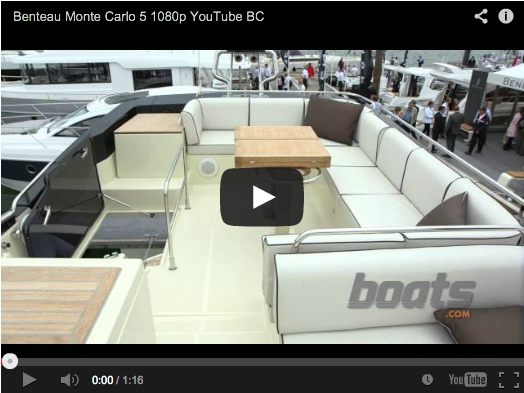 For more information, visit Monte Carlo Yachts. See Monte Carlo Yacht listings.